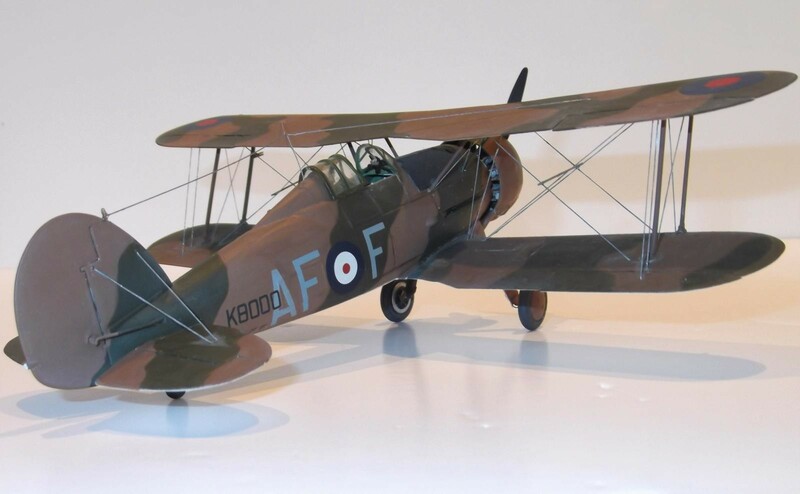 Away from my normal focus on the BoB, I made this 1/48 Roden kit some time back after meeting the son of William Francis Blackadder, who joined the Auxiliary air Force in 1937 and in mid November 1939 flew with 607 (County of Durham) Squadron to France to support the BEF and the Allies against the German threat after the invasion of Poland and the declaration of war. 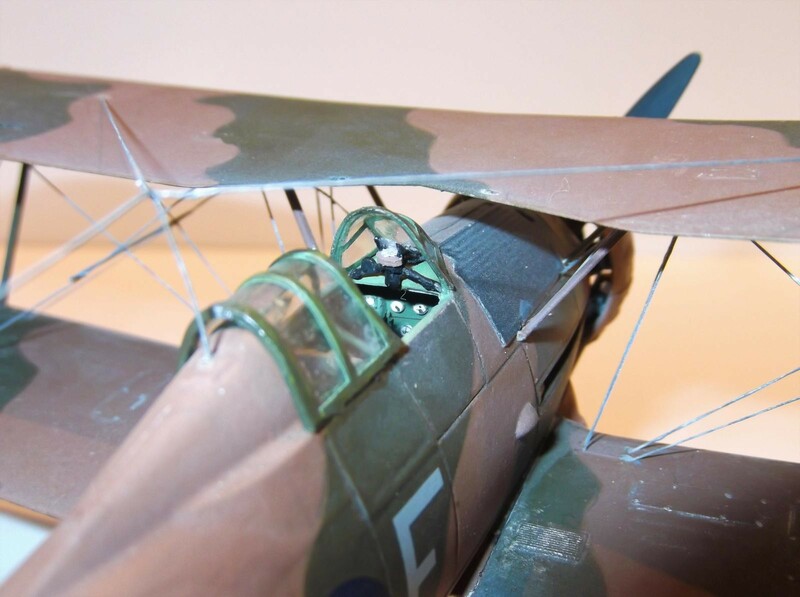 This is a model of the a/c that he flew across the Channel with the squadron not receiving replacement Hurricanes until just before the German push west in May 1940. 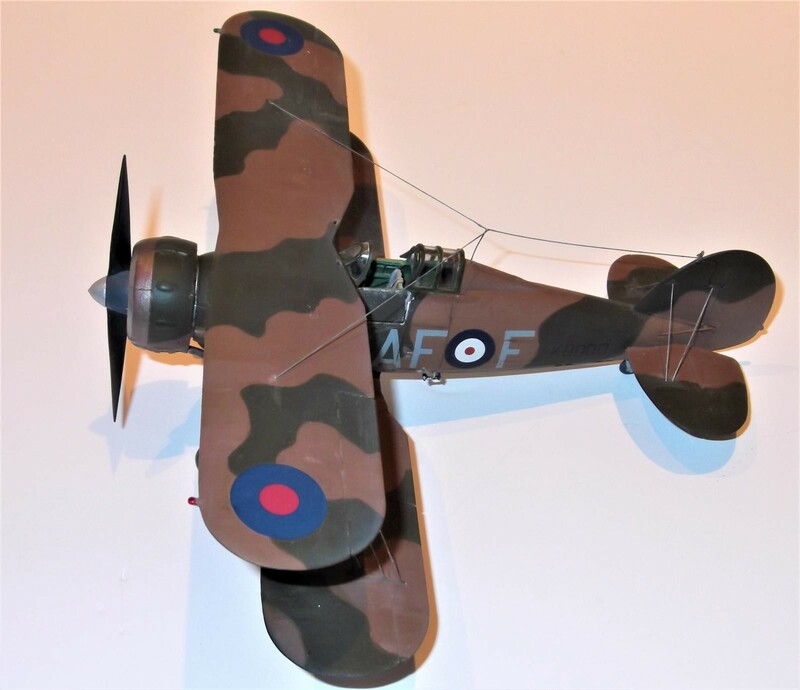 Gladiator K8000 was lost in March 1940 when the squadron was practising squadron attacks in France. It collided with another of the unit’s aircraft when both pilots were killed. 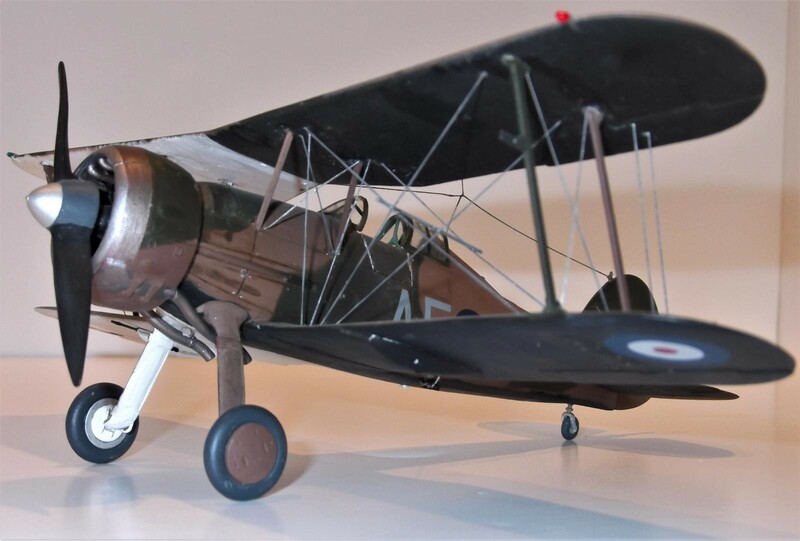 Francis Blackadder wasn’t involved in this tragedy and after leave back in England in early May 1940, returned to 607 Squadron and eventually returned to England after Operation Dynamo. He flew Hurricanes with 607 Squadron through much of the BoB based at Tangmere near Chichester and was awarded the DSO and promoted to Flying Officer. He went on to command 245 Squadron in 1941 and survived WW2. 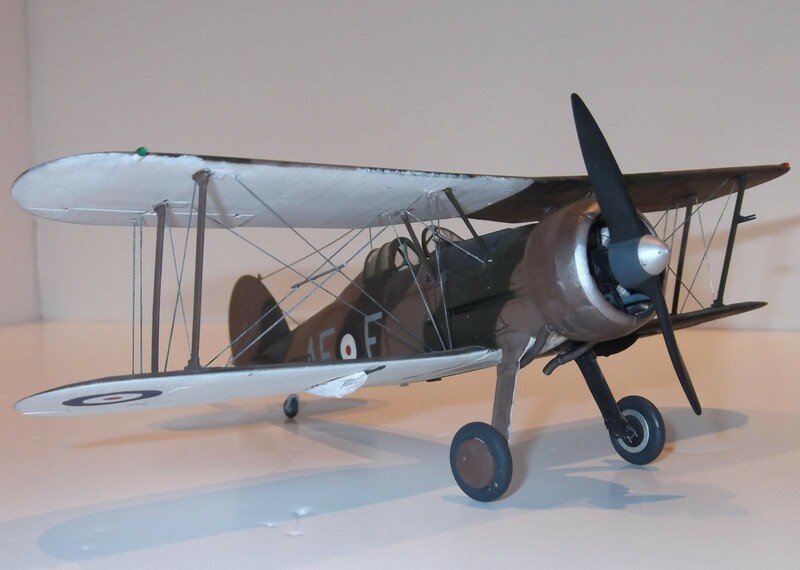 I’ve always admired the Gladiator as a graceful design, albeit with a relatively short front-line fighter life span, effectively curtailed as faster monoplane designs came on the scene. A very good looking Gladiator. I have the Roden kit I in the stash but it’s the version with skis. I hope mine turns out as good as yours. Paul, gotta ask, might this be the source for the TV series name? I hope his mechanic wasn’t LAC Baldric? Sorry, I couldn’t resist! I suspect the Blackadder family, which stems from William Francis Blackadder, was partly a stimulus for the hilarious (in parts) TV comedy series. I’ve no idea whether the writers had some connection with the family whose roots are firmly established in the north of England. The TV company behind the series invited current members of the Blackadder clan to a viewing of lots of out-takes and prime scenes which was itself televised. I watched it and saw Robert (the son) chickling away. LAC Baldric was sadly nowhere to be seen. Paul, thanks! Like the curates egg, good in parts. I got to see an episode here and there, like the never-to-be-forgotten Christmas show. Last one I saw was set in WW I.
Lovely Gladiator! 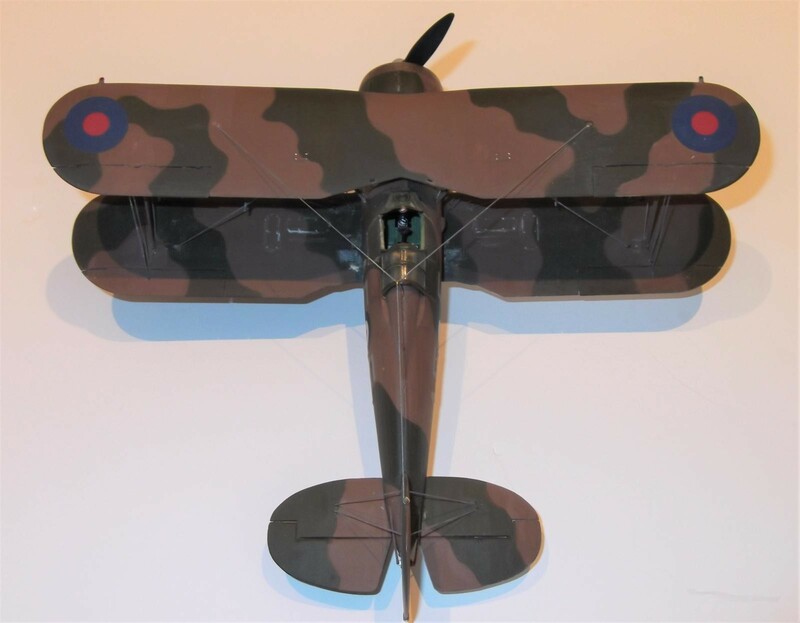 Another of the hold-the-line fighters that soldiered on until the later aircraft arrived. 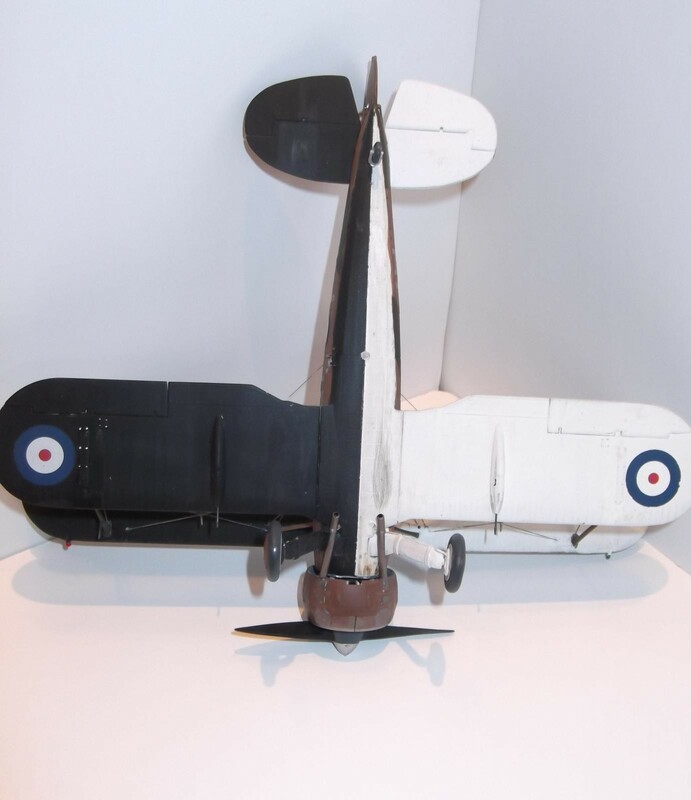 End of the combat biplane. Like Greg….bi-planes are not my forte (all that rigging, for one thing), but this is pretty good-lookin’ build…IMO, you did a nice piece of work there. 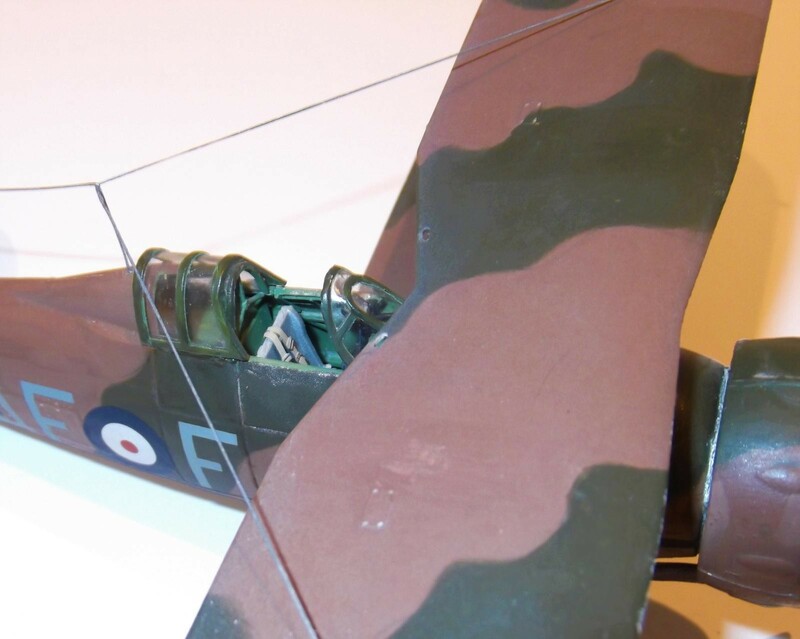 Greg – My first biplane since I re-started modelling and I rediscovered all those twitchy moments especially when you have to wiggle the top wing into position. Eventualy came good though. I know what you mean about the Malta Glads – very evocative – but I was glad to hang mine on a lesser-known story. Nice!!! The Gladiator has got that classic look to it. Lovely! I’d love to know the Brit’s reasoning for the black/white underside. It’s odd, but very interesting. Yours is a great project. Well done, Paul! Jeff – It was a brief variation on the underside colours, with the hopeful thought that those on the ground/sea might recognise friendlies so avoid blue on blues. Don’t think it worked particularly well since most allied soldiers and seamen tended to think anything overhead wasn’t friendly. I think the official “black” was actually called “night” and it had a tint of blue to it, rarely discernible. I used black. Some a/c also had some panels unde the fuselage left in aluminium colour. Thanks for the explanation, Paul. I suspected it had something to do with aircraft recognition, a subject near & dear to me that I taught during my time in the Army. You’re right … most of the time folks believe that whatever flies overhead probably isn’t friendly. That notion hasn’t changed appreciably since the days powered kites began flying over different folks as well as soldiers/sailors/etc. The famous “If it flies, it dies” that started (at least) in WW I. Nice work on the model. I loved the TV series (I really wish they had done their take on Gladstone/Disraeli, which would have been really hilarious). My mother worked at Gloster in the canteen around 1940. She said the Gladiator test pilots were so handsome. Women!